The Pound soared past 1.3000 against the dollar reaching 1.3070, its highest in over two weeks, as investors were thrilled with renewed Brexit hopes. Junior business minister Richard Harrington said that the UK Parliament would take control of Brexit if PM May can't pass a deal next February 27. PM May´s spokesman said that the PM is still looking to reopen the withdrawal agreement, with no signs that EU officials are willing to do so. The UK unemployment rate was steady at 4.0% in the three months to December, and average hourly earnings increasing by 3.4% in the same period. Today, PM May and EU's Juncker will have a meeting in an attempt to break the stalemate over the Irish border. 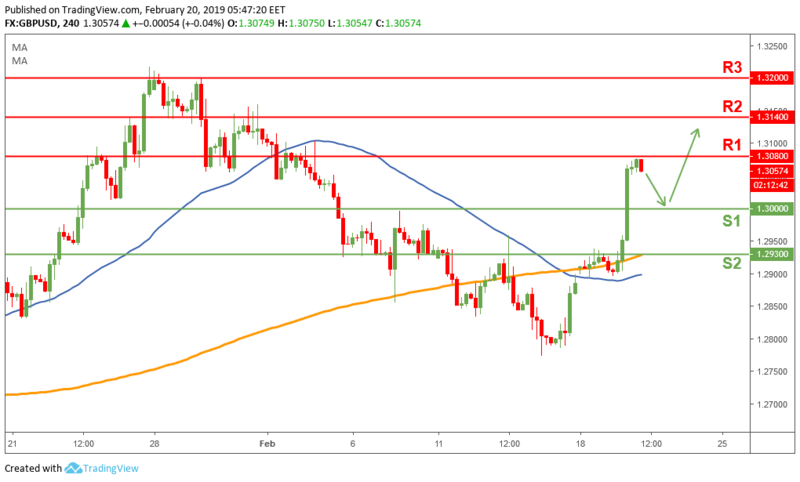 The Pound broke above the psychological round number 1.30 and currently sitting just under 1.3080 (R1) resistance level. We could see a pullback in prices towards 1.30 (previous resistance, new support), before attempting to break above 1.3080 (R1) and possibly retest 1.3140 (R2). The bulls will remain in control as long as price is trading above 1.3 (S1).